Anthony Marsh, CEO of West Midlands Ambulance Service NHS Foundation Trust (WMAS), is to become improvement advisor at East Midlands Ambulance Service NHS Trust (EMAS) as part of plans to help turn around the struggling service. Marsh will be supporting EMAS on an interim basis, providing advice and support to the executive team. He will work the equivalent of one day a week, starting from Monday 25 April 2016, for a period of 6 months. It has been confirmed that he will continue his role as CEO of WMAS. EMAS chairman, Pauline Tagg, has been in discussions with NHS Improvement over how the service could strengthen its leadership following the departure of its former chief executive, Sue Noyes, due to “personal reasons” in March. Mr Marsh’s appointment comes at a time when EMAS is facing considerable financial and performance difficulties. Latest figures released by the Trust reveal a £12.46 million deficit—20 times the planned amount of £0.12 million. The service’s financial position has triggered escalation with its regulator, the NHS Trust Development Authority, resulting in the application of a loan for £9 million. Responses to Red 1 calls at EMAS have been well below the national target of 75%, with the service failing to achieve a response within 8 minutes in 7 out of 8 months this year. In addition to Mr Marsh’s appointment, Richard Henderson is to continue in the role of acting chief executive until further notice. Henderson has held a number of clinical and operational senior managerial roles including divisional director for EMAS’ Lincolnshire division, and chair of the National Ambulance Service Director of Operations Group. David Whiting is to become chief operating officer for the next 6 months. Whiting has over 30 years’ experience in the ambulance service and previously worked for EMAS as director of operations until 2009. “I’m excited about my return to EMAS and look forward to working with colleagues and staff to help further improve services for the communities we serve,” said Whiting. Mike Naylor becomes acting finance director from today, as current director of finance Richard Wheeler leaves EMAS. Naylor has been leading EMAS’ future planning and budgets work for 2016/17 since 1 April. “These leadership appointments bring expertise, knowledge and experience to allow us to continue to transform and improve services for our patients,” said Tagg. Taken from Journal of Paramedic Practice, published 22 April 2016. 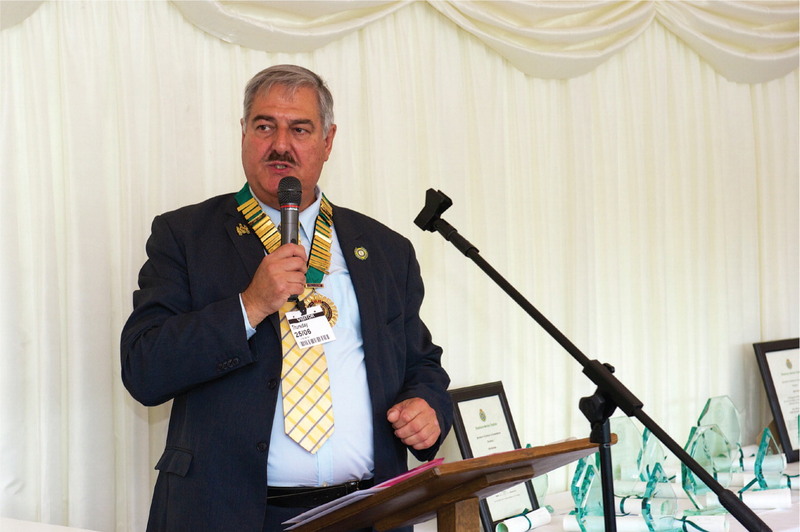 Friends and family gathered at the Cholmondeley Room and Terrace, House of Lords, on 25 June to celebrate the Ambulance Service Institute (ASI) annual awards. The occasion recognised those in the pre-hospital care sector who have performed above and beyond the call of duty, in their dedication to saving lives. The awards were presented by Dr Peter Griffin, president of the ASI, who gave a brief welcome address before proceeding with the awards. 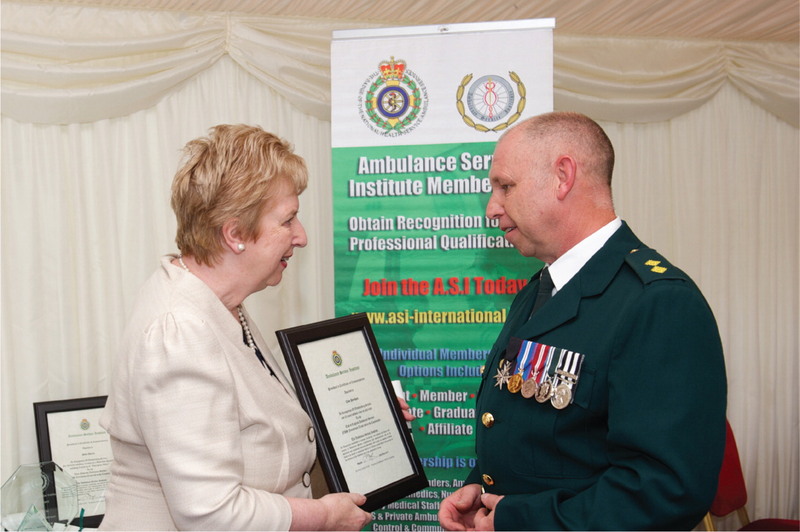 The ASI was formed in 1976 and has members throughout the UK NHS ambulance services and in various overseas ambulance services. It is an independent institute whose membership is dedicated to improving, monitoring and raising the standards and quality of ambulance provision and thereby improving the professionalism and quality of care available to patients. Set up in 2000 and originally held at AMBEX in Harrogate, the ASI Awards were initially only for NHS ambulance service personnel. However, the awards now incorporate accolades for military, private and voluntary services. The Paramedic/Emergency Care Practitioner Award went to Alex Watts of East of England Ambulance Service NHS Trust, who was first on scene at a multiple fatality road traffic collision on the Colchester Road at Gosfield in December last year. Watts was commended for his actions in the initial management of the scene, placing himself at risk to organise and effect a rescue of at least three patients. President’s Commendations went to motorbike paramedic Steve Harris of West Midlands Ambulance Service NHS Trust and paramedic Clive Parnham of East of England Ambulance Service NHS Trust. Steve, affectionately known as ‘Forrest’ by colleagues as well as fans of Channel 5’s Emergency Bikers, recently retired from 18 years as a motorcycle paramedic. Although taking life at a slower pace, he still patrols the streets of Birmingham on a part-time basis, all in the name of patient care. Clive was nominated for being a dedicated and supportive member of staff who is always willing to assist. His citation referred to him as a great model to others and a great support to all new staff in his care. It was mentioned that if you were to cut him in half he would read ambulance service through the middle. The Innovation Award went to the West Midlands Mental Health Response Unit, collected by Robert Cole, head of clinical practice at West Midlands Ambulance Service NHS Trust, and chief inspector Sean Russell of West Midlands Police. Starting as a trial scheme in January last year, the inter-agency mental health triage unit has seen a dramatic reduction in the number of people suffering from mental health who ended up in police custody in the local area. The Control Room Award went to Heather Wilson of East of England Ambulance Service NHS Trust, whose passion to her role and her commitment to improving the quality of the service provided to patients has led to her rapidly progressing from call handler, to dispatcher, to dispatch team leader in a little over two years. The First Aid/Community First Responder Award went to Rossendale Community First Responder Group. The award was collected by Brian Pickup and Dawn Taylor who organise the local group. Their nomination was based on their dedication and professional approach to volunteering, and the way they work in partnership with the North West Ambulance Service NHS Trust. The Patient Transport Service Award went to Stephen Dines and Justine Newton of East of England Ambulance Service NHS Trust for the way they dealt with an unusual and difficult incident. They were said to have showed professionalism and remained calm and reassuring to their patient until help arrived. The Special Incident Award went to paramedic Louise Smith and technician Joanne Taylor of East Midlands Ambulance Service NHS Trust, who were commended for their actions after being involved in a crash while transporting a patient. The Air Ambulance Award went to Sergeant David Currie, a search and rescue winchman at RAF Valley. Currie received his reward in recognition of his assistance to a man who had fallen into a quarry in the vicinity of Horseshoe Pass, Wrexham. Displaying exceptional clinical skills, clarity of thought under pressure and outstanding management of his winch operator, it was felt his action unequivocally saved the life of his casualty. The Front-line Ambulance Award was given to technicians Neil Ashmore and Sarah Lawrence of West Midlands Ambulance Service NHS Trust, who attended a severe fire in Tipton in August 2014. They were praised for their bravery at the scene, where they acted above and beyond the call of duty, at great personal risk, to care for the two patients injured as a result of the fire. The Military Award was presented to Sergeant Simeon Tomlinson, a senior non-commissioned officer paramedic with 4626 Aeromedical Evacuation Squadron, RAF Brize Norton. Tomlinson is the only reserve paramedic to have undertaken three deployments as part of the rotary Medical Emergency Response Team (MERT) and was recognised as a super clinician, admired by his fellow colleagues and noted for providing the best paramedic care on a daily basis. Billy McPhail and Gareth Acres received the Public Spirited Award for an incident at Strood Railway on 28 May 2014, where they rescued a woman who had slipped and fell on the railway line. Two paramedics from the West Midlands Ambulance Service NHS Trust (WMAS) have gone to Nepal to assist in the humanitarian rescue operation, following the devastating earthquake that hit 80 km north west of Kathmandu on Saturday. The earthquake, which measured 7.9 on the Richter Scale, has claimed the lives of over 5000 people, with many more still trapped under the rubble. Steve Watkins is a paramedic and member of Search and Rescue in Disasters (SARAID), a British charity dedicated to trying to save the victims of disaster. Simon Greenfield is a Hazardous Area Response Team (HART) paramedic and member of Humanity First Medical, a group of health professionals who aim to provide help during disasters and peaceful times supporting medical needs. They are joined by Dr Malcolm Russell, a medical incident officer with WMAS and BASICS emergency doctor with Mercia Accident Rescue Service in Herefordshire. He is also medical director, Urban Search and Rescue Medical Team, of the UK International Search and Rescue Team. He provided support during the Christchurch earthquake and Japanese tsunami, and flew out on Sunday to Nepal along with a team of 67 firefighters/medics, four dogs and over a tonne of rescue equipment. ‘Our good wishes go with all three of them as they go into what will undoubtedly be an horrific scene. They will, as part of the relief effort, be able to provide invaluable assistance to local communities in the stricken areas. The East of England Ambulance Service NHS Trust (EEAST) has unveiled plans to place 1,000 new defibrillators across the east of England. The investment, which will cost just under £1 million, will see public buildings such as sports centres, village halls and libraries across the six counties EEAST serves, receiving the lifesaving devices. Distribution of the defibrillators has already begun, and it is hoped that all 1,000 devices will be in position by the end of March. The Trust is aware of more than 300 automated external defibrillators (AEDs) across the region that can be accessed by a member of staff or the public when they go into cardiac arrest. North Norfolk is receiving the first 50 defibrillators, another 20 are going into Suffolk, and 40 are being sent out across North Essex. Another 30 are going into Cambridgeshire and 10 in Bedfordshire and Hertfordshire. Locations for the remaining devices will be unveiled in due course. ‘I’m delighted that we have started this important project to invest in the communities we serve by improving access to these lifesaving devices in key locations. The numbers of paramedics leaving NHS ambulance services is increasing, according to figures obtained from ambulance Trusts. At least 1,015 paramedics left their job in 2013–14, compared with 593 in the same period two years earlier. This has meant crews are under greater pressure than ever before to meet demand. As the amount of emergency calls continues to rise each year, there has failed to be an equivalent rise in the number of qualified ambulance staff. Taken from Journal of Paramedic Practice, published 20 October 2014. 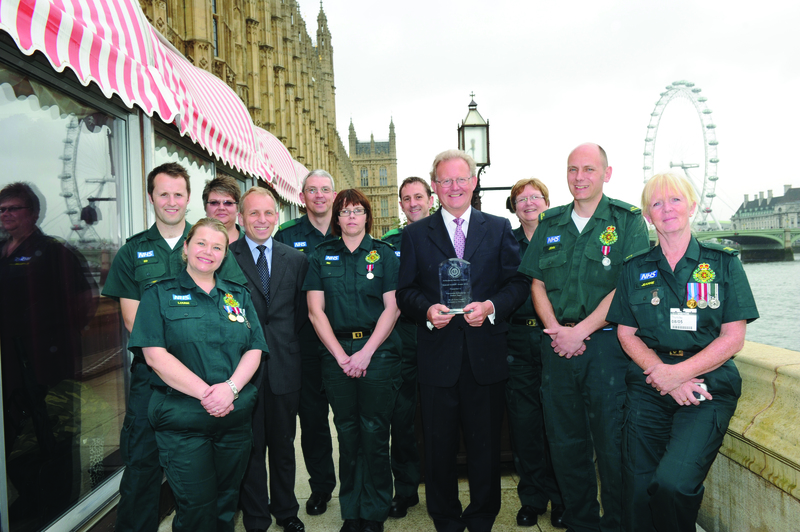 Friends and family gathered at the Cholmondeley Room and Terrace, House of Lords, on 8 May to celebrate the Ambulance Service Institute (ASI) Annual Awards. The occasion recognised those in the pre-hospital care sector who have performed above and beyond the call of duty, in their dedication to saving lives. Set up in 2000 and originally held at AMBEX in Harrogate, the ASI Awards were initially only for NHS ambulance service personnel. However, the awards now incorporate accolades for military, private and voluntary services, and an international award was introduced in 2011. 2014 saw a 55% increase in nominations over the 11 award categories, resulting in the awards committee being split into six smaller committees deciding on two to three categories each. Among the winners, Fellowship was awarded to past ASI president Carl Ledbury, and Honorary Fellowship to Prof Ian Greaves, professor of emergency medicine at James Cook University Hospital, Middlesburgh; and Prof Sir Keith Porter, clinical service lead for trauma services at the Queen Elizabeth Hospital Birmingham. The President’s Commendation for Long Service went to Dennis Oakes of South Western Ambulance Service NHS Foundation Trust, who retired recently after 50 years of service. Oakes was praised for dedicating his entire life to caring for others. The Innovations Award went to East Midlands Ambulance Service NHS Trust for the use of USB ECG leads linked to Toughbook PCs to improve efficiency and governance, as well as to reduce cost. The Control Room Award went to Fiona Dinkel of Yorkshire Ambulance Service NHS Trust, who was noted as an outstanding emergency medical dispatcher with an almost exemplary audit history. The First Aid/Community First Responder Award went to Craig Singleton of West Midlands Ambulance Service NHS Foundation Trust for his management of an incident in Gnosall involving a 4-year-old child who had been attacked at home by a Staffordshire Bull Terrier. The Private/Voluntary Ambulance Service Award was presented to St John Ambulance, District 5, South East Region for exceptional contributions made in support of a number of critical incidents. The Patient Transport Service Award went to Alex Laston and Louise Ormsby of West Midlands Ambulance Service NHS Foundation Trust for their involvement in attending to a road traffic collision involving a female pedestrian and a large goods vehicle. The Special Incident Award went to South East Coast Ambulance Service NHS Foundation Trust for their management of the Sheppey Bridge Incident, the biggest road traffic accident in Kent’s history, with more than 300 cars caught up in the early morning crash. The Air Ambulance Team of the Year Award was presented to Helimed 03 and Helimed 09 from Midlands Air Ambulance, who demonstrated excellent team work in treating a 33-year-old male worker trapped in a tunnel under a large potato-sorting machine. The Front-line Ambulance Award was given to Lance Corporal Malcolm Martindale of the Royal Army Medical Corps for his provision of front-line ambulance medical support to deployed British forces in Afghanistan. The Military Award was presented to Sergeant Ryan Briggs, an RAF medic who helped form a small quick response force which treated casualties of the Taliban raid of Camp Bastion in Helmand Province, Afghanistan on 14 September 2012. The Paramedic/Emergency Care Practitioner Award went to Paul Gibson of East of England Ambulance Service NHS Trust, who selflessly saved a woman from a flat in Ipswich that was engulfed in flames after learning that she was trapped inside. George Reader, dock master at Watchet Mariner in Somerset, received the Public Spirited Award for his bravery in saving a 6-month-old baby who was plunged into the icy waters at Watchet Harbour when a gust of wind swept the child’s buggy into the water. Taken from Journal of Paramedic Practice, published 6 June 2014.